It’s 5:20am, and I’m up before the alarm goes off after rousing a couple times earlier. Now following everything I had laid out, Empire singlet, running shorts, breakfast, feed the cat, backpack, I go meet my friends at the park-n-ride. Empire Runner friends riding together included Kate Papadoupolos, Paul Berg, Brad Zanetti and I. We arrived and went through the usual run preparations: put the car key where the sun don’t shine, (Not there! ), bib number, warm up. They have shuttles take bundles of belongings to the finish area. More preparations: porta-potty line with friendly people, adjust shoes. This race has staggered starts, arranged by age and gender, with a group starting each minute for quite a while. Maybe that’s another reason I like this race, as an old guy like me still has half a chance! Paul led Brad and I on a warm-up run among houses surrounded by redwoods. We were impressed by the Mill Valley neighborhood. We were running in the “Invitational” group, which gets to have their staggered starts first. 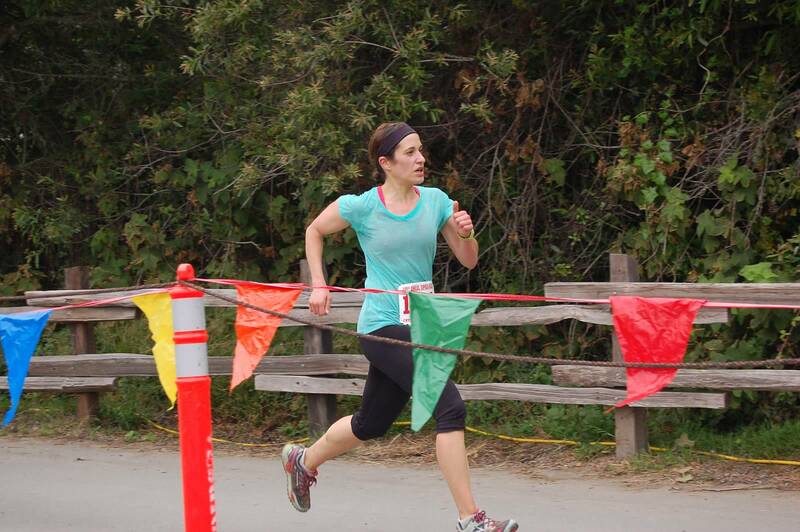 Kate was running her first Dipsea, so she had to run in the “Runners” group, which follows the invitational. If Kate could still finish within a certain number, (I think about 750), she would qualify to be in the invitational next year. We had no doubts that she would. This was a big day. The 105th running of the Dipsea Race, from Mill Valley up over part of Mount Tamalpais to Stinson Beach. This race goes up hundreds of steps, then down into Muir Woods, then up for about 2.5 miles for a net elevation gain of about 3000 feet. One goal is to get to the top of the “Cardiac” trail, where runners have installed a water fountain. This is followed by some gentle rises and drops with beautiful scenery, before the trail begins a steep decline, as in watch your step with an extra “eeee!” down towards the beach. Some of the paths are rocky, some over rustic steps turning this way and that, then up again at “Insult” hill and down the “Swoop” which used to be a secluded short cut, but now taken by most shooting down a dirt trail with bushes at each elbow, while some runners are hoping to pass. (I think a run-on sentence is appropriate in this case, as run on is what’s on everyone’s mind.) Still, there were some parts of the race where I so enjoyed flying over humps around trees, over rocks, and down the gravel path getting close to the finish. Such fun, and still appreciating the view, and all these healthy happy people, well most anyway. For me, it involved a lot of concentration, watching each step, telling myself to be up on your toes, keeping your feet under you. I feel it in my stomach muscles/gut, as this race works my body core. At the finish, I met Paul, who finished ahead of me after we passed each other during the race. It’s good to have running buddies. Then Brad, and Kate came in with a time about 5 minutes faster than the rest of us. We were greeted by Paul and Brad’s families. More and more runners kept coming in, including our famed Darryl (Beardall), who told us this was his 60th Dipsea! The trophies, plaques, photos and stories on display for the historical race filled several tables. And then there was the stack of black shirts for the first 35 finishers. From my point of view, it was awesome. Also, I really appreciate the people of the Empire Runners, who are so supportive of each other. So we run. Run as we enjoy it. Run as we were made to do. Back home now, feeling good and smiling, smiling on my face and deep inside. Thank you to all of you who share this. Hope to see you at the next run, maybe the next Dipsea?